Our 6×7 fibre core galvanized steel wire rope is a general-purpose rope suitable for use in a wide range of applications including fencing rope, standard rigging and other general engineering applications. Fibre core 6×7 wire rope offers slightly more flexibility than 7×7 wire strand core rope which is essentially the same rope albeit with a different central core. Our 6×7 galvanised steel wire rope is available in a wide range of diameters; however, the rope loses some of its flexibility the wider the depth you opt for. For this reason, the 6×7 rope is often favoured in smaller diameters, typically 2mm or less, though they are available up to 16mm. 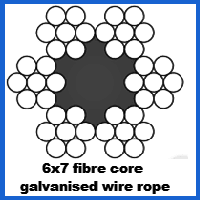 Where 6×7 ropes are used in applications where a stiffer rope is required, for example when used as a mast stay, then they are often recommended in diameters of 6mm or above. In a 6×7 rope, the wires tend to be larger than other constructions of the same diameter which lends the rope significantly increased abrasion resistance. It should be noted however, that this increased abrasion resistance comes at the cost of the ropes overall bendability and you should expect for the rope to have decreased fatigue resistance. Our 6×7 fibre core rope is designed for harsh conditions where its larger outer wires offer enhanced breaking strength. To enquire about this product, please call us on 01384 78004. Alternatively, you can contact Rope Services Direct through our website by clicking the following link. 6x7 Fibre Core Galvanized Steel Wire Rope Overall rating: 5 out of 5 based on 6 reviews.